What is a motherboard? Where is the motherboard? Do I need one? These are all valid questions when it comes to the motherboard. A lot of development goes into this piece of computer equipment. 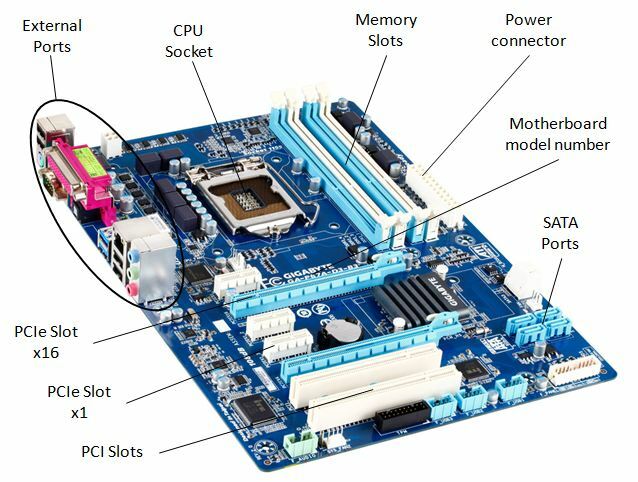 In this page we will discuss the computer motherboard and how it works. First of all let's have a look at a picture of a motherboard and then we will discuss it. Wait, don't run away, let me try to explain first. The motherboard looks very complicated, but it's actually quite simple to understand. As you can see, from the above picture, all components such as CPU, memory (RAM), hard disks, PCI (Peripheral Component Interconnect) cards, ports and power connect to the motherboard. It's like the mother ship in science fiction movies. Everything comes together in the motherboard. The picture above is quite an old one of an AMD processor type, but they haven't changed it much since then. Later I'll discuss the layout of the motherboard. There you will see exactly what goes where. IF you have worked a little with motherboards then identifying the components and slots are easy. The motherboard does not operate on it's own. By that I mean that the motherboard is built into a thing called the computer case. You cannot just build any motherboard in any case. There is another thing called the form factor of the motherboard. All this is is the shape and size of the motherboard. Two very common types are the AT (Advanced Technology) and ATX (Advanced Technology eXtended) form factors. The AT form factor is old and is not used anymore. 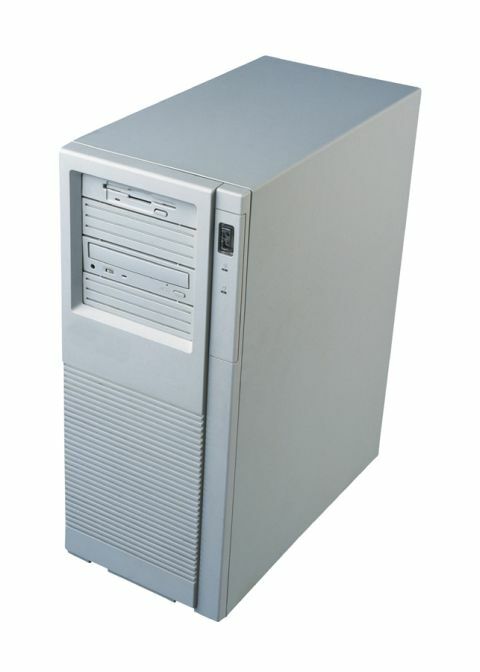 The ATX is the standard today and there are variations on the theme such as microATX and flexATX. MicroATX, for instance, is just a smaller version of the ATX standard. The form factor just defines the layout, size and shape of the motherboard. How would you know what form factor motherboard you have? Easy, check your motherboard documentation that shipped with the motherboard or write down the model number and search for it on Google or the manufacturers website. Let's have a look at the motherboard layout. Don't worry about all those chips and circuits. The important thing is to identify the core slots and ports on a motherboard. If you know this information, then it's easy to identify them on other motherboards as well. Let's have a look at a typical motherboard layout. Below is a picture of a ATX motherboard. I have identified the slots and ports and CPU sockets. The CPU socket is where the CPU goes. 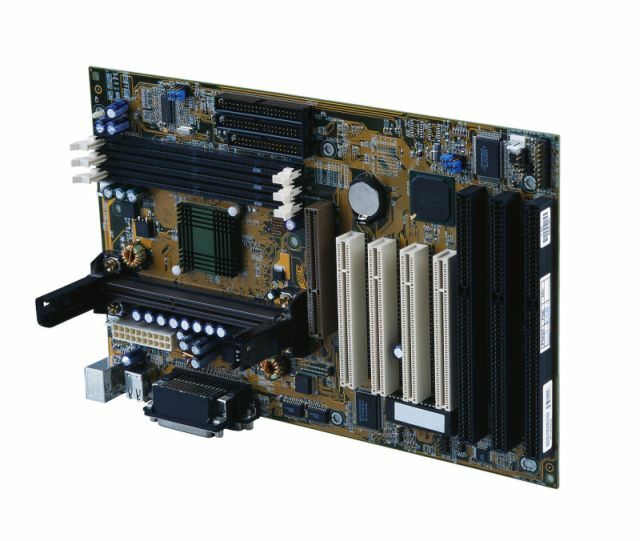 This specific motherboard uses a LGA (Land Grid Array) 1155 socket. The LGA 1155 can take the new Intel 2nd generation Core i3, i5 and i7 CPU's. These socket types just identifies the type and make of CPU it can hold. You can find this information in the motherboard manual. The memory slots is where the memory goes. These days most computers uses either DDR2 or DDR3 memory modules. This specific motherboard supports DDR3 memory modules and can handle a maximum of up to 32GB's of memory. That's quite a lot. The memory slots are also color coded. This is an indication of where memory should be populated for best performance and operation. For example, on this specific motherboard the white memory slots should first be populated and then the light blue slots. If you are unsure, read the manual. The Power connector is where the power from the power supply will feed the motherboard. It's usually just a cable that runs from the supply to the power connector slot on the motherboard. The are also usually keyed meaning the cable can only fit in the connector in a certain way. This prevents you from inserting the cable the wrong way and frying your motherboard. The Model number is the number of the specific motherboard. In this case it's a Gigabyte GA-P67A-D3-B3. If you don't have the manual for the motherboard, then you can use this number to search for it on Google or on Gigabytes website. The SATA ports are the SATA hard disk ports. You would connect a cable from these ports and on the other end you would have your hard disk. The newer motherboards have support for 6Gbits/s transfer rate. This equates to about 600MB/s. On this motherboard, there are 2 ports at 6Gbits/s and 4 at the more traditional 3Gbit/s. Again, all this info is either printed on the board, or you will find the information in the manual. The PCI and PCIe slotsis where your expansion cards will go. If you need a fast graphics card or a great sound card, then this is where you would slot it in. The slots are either PCI express or normal PCI slots. The speeds varies between the different slots. There are 3 PCIe x1 slots, 1 PCIe x16 slot, 1 PCIe x4 slots and 2 PCI slots. You can see this info clearly on the motherboard. Below is a picture of the slots and their speeds. You will notice that the type of PCI and PCIe slot is printed above the slot. I don't want to explain the difference between PCI and PCIe in detail here, but PCI express or PCIe uses a point to point connection from the PCI adapter to the PCI bridge on the motherboard. It's similar to fibre channel switch architecture. Normal PCI, shares the bandwidth of all connected devices on that channel. Don't worry too much about it. In a separate page I discuss what PCI express is. Then you get the External ports. These are the ports where you will connect all your cool stuff such as USB flash drives, printers, Audio speakers and network cable. 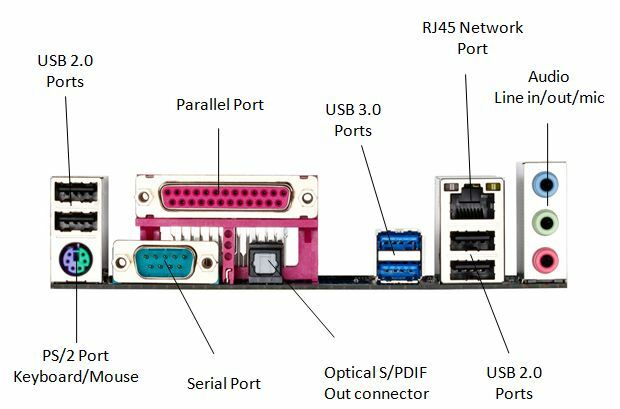 Below is a typical layout of the ports you will find at the back of your PC. Keep in mind that there are different types of ports on motherboards. It all depends on what you bought. Check the spec's before you buy. Most of these ports are pretty self explanitory but I will discuss some of them. These days you will find that more and more motherboards ship with USB 3.0 ports. In the example ports above, there are 2 x USB 3.0 ports and 4 x USB 2.0 ports. USB 3.0 has a higher transfer rate than version 2.0. More and more devices are being made available with USB 3.0 support. Soon, USB 2.0 ports will be replaced in favor of USB 3.0. This is just how technology goes. In a couple of years USB 3.0 will be replaced by something faster and better. I don't know why motherboard manufacturers include parallel and serial ports. They are hardly used anymore. I'm a hardware engineer and I hardly use it. I use USB devices for all my external connections. The parallel port is mostly used for printer and scanner devices, but most devices are USB anyway. These ports might be included for legacy support. Maybe you have old printers and scanners or even a serial modem device that you still want to use. Another port which is quite rare, is the optical S/PDIF (Sony/Phillips Digital Interface) connector. Well, maybe not rare, but certainly not standard. This is for high definition audio. If you are serious about your music then you would most definitely invest in a top of the range sound card. This port could be useful to connect your amplifier and listen to high quality audio on your hi-fi system. Some people don't even know what this port does. Now you know. The other ports are quite well known and is available on most motherboards, even on laptops. What is a motherboard - What is on-board devices? All of these ports are driven by on-board devices. This means that the network, audio, USB, serial, parallel and PS/2 connectors runs from chips that are built into the motherboard. The cool thing here is that you don't need to buy any add-in cards to get network or sound from you PC. It's all built into the motherboard. Motherboard manufacturers are building more and more stuff into the motherboard so you don't need to buy it separately. This, of course, makes the motherboard a bit more expensive. What is a motherboard - What should I buy? I would suggest that you have a look at the motherboard features before you buy. Look at the on-board devices on the motherboard before you buy one. Some motherboards even comes with a display adapter and audio, so you don't need to buy it separately. This would save you some money. Gamer's and musicians will almost always buy the display and sound adapters separately. They need these specialized adapters to get their work done. The on-board graphics and sound will not be enough. They would also look at motherboards that don't have on-board graphics or sound. It all depends on what you want to do with your PC. So, where do you put this motherboard? The answer is, in the case. Below is a picture of what a computer case looks like. This is from the outside. Everything is nice and neat from the outside. Everything is built into the case. You hard drives, power supplies, add in adapters and so on. If you have a look at the inside, it looks pretty scary. 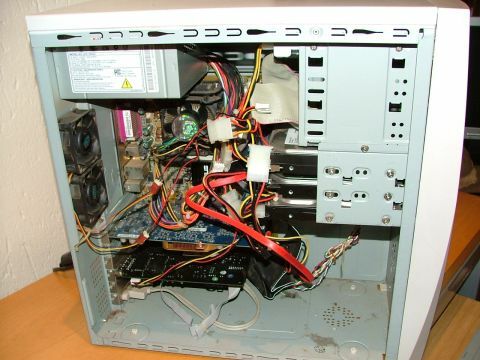 Below is a picture of my old PC with all the cables connected to the different components. It looks scary, I know. I just have to tidy it up a bit and it should look a bit better. I was in a hurry and I though to myself, "The cover is closed, you cannot see the inside anyway." Try to keep it neat, it's easier to work with the internal components if all the cables are neatly tucked away. Use cable ties to tie up the cables if you have to. There's not much to say about the computer case. They come in all shapes and sizes and usually have the power supply built in. They could be cheap or very expensive. The prices varies to much to give you estimates here. Keep in mind that you must match you form factor of the motherboard to the case you are buying. You cannot buy a ATX motherboard and try to fit it into your old AT form factor case. It would not fit. Check the specs before you buy. Ok, so the motherboard is the center of your computer. It fits into a computer case from where you can connect all your external devices. There are different types and shapes, which is known as the form factor. Before you buy a motherboard, have a look at the features and on-board devices. Read the online manual or go to the manufacturers website and have a look at the features there. So, now you know what is a motherboard.